Its funny but I thought I would’ve dropped this one by now, yet its still worth the read. I don’t think any other comic that I can remember has done so much by avoiding the main story for so long. 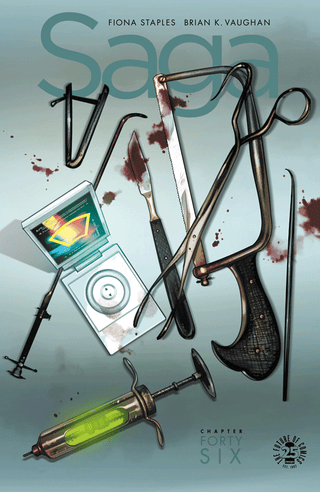 Saga #46 - An operation and a farewell. Black Magick # 7 - The Holy has been desecrated, the Hammer is closing in, and the Dunridge case hits a snag…one that only reinforces Morgan’s growing suspicion that the killer he and Rowan are seeking may be none other than Rowan herself. Writer Greg Rucka and Artist Nicola Scott. The Book of Lost Souls #1 & 2 - Jonathan meets Mystery and the Dark Man. Before jumping off a bridge a man gives him a book. Jonathan and Mystery help a housewife named Mary who is lost in daydreams: she is a princess and her abusive husband is a dragon. Writer Michael J. Straczynski and Artist Coleen Doran. Whacha got? Anything good? Don’t forget to include web comics if you got ’em.